From jellyfish and sea otters to oak trees and grapes, everything in Monterey County is directly influenced by the Bay and Canyon. The wines of the Blue Grand Canyon are no exception. Hidden beneath the surface of the Monterey Bay is an enormous submarine canyon that is sixty miles long and two miles deep. The largest and deepest on the West Coast, this canyon is also unique in its close proximity to the shoreline. Comparable in size and depth to its more visible counterpart in Arizona, this Monterey geologic wonder has been nicknamed the Blue Grand Canyon™. Situated less than 100 yards off Moss Landing, the Blue Grand Canyon™ provides a climatic pathway that connects the deep sea to the wine growing regions of Monterey. At an estimated volume of 300 cubic miles of deep, cold water, the BGC’s vast weather effect on the viticultural districts of Monterey is manifested through fog, wind, lack of rain through the growing season, and moderate temperatures. 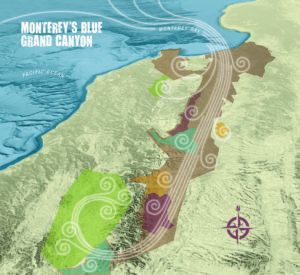 The wines of the Blue Grand Canyon™ deliciously express their birthplace – their style and structure are a reflection of their vineyards’ “sense of place” in relation to this unique meeting of land and sea. This swath of ocean is an incredibly special place, and is protected as the nation’s largest National Marine Sanctuary. From rugged rocky shores and lush kelp forests to one of the largest underwater canyons and the only protected seamount in North America, the Monterey Bay National Marine Sanctuary is one of the most diverse and dynamic marine ecosystems in the world – – and its right here in our backyard!